In April, 1886, a chapter of Phi Delta Phi was installed at the University of Pennsylvania and named in honor of Chief Justice Gibson of Pennsylvania. This Law School fraternity first appeared in The Record of 1888, no doubt filling the place formerly represented by the Sigma chapter of Delta Beta Phi. 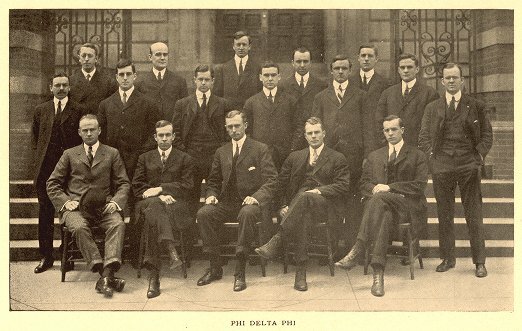 Phi Delta Phi appeared in The Record for five consecutive years, then lost its place for twelve years before re-appearing in The Record for 1897. Baird’s Manual of American College Fraternities (1930 edition) stated that the Gibson chapter was established at Penn in 1886 and was still active in 1930.